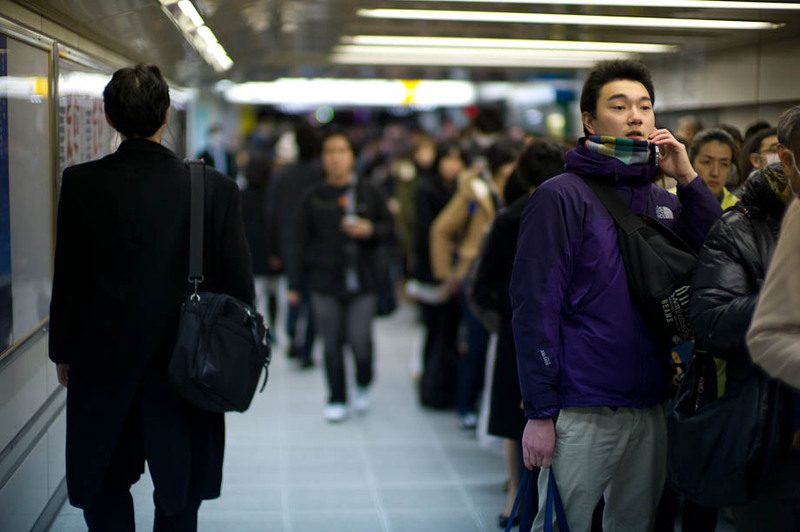 Tokyo's strange vibe that has been in the air all week seemed like it was lifting this morning. I noticed how much more lively the city was this morning on my commute to work. There are still concerns about fuel and power. 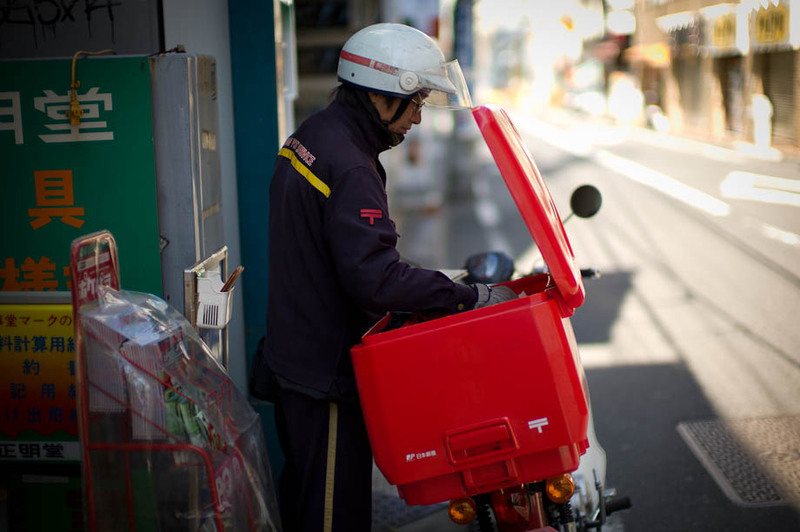 Food is readily available in Tokyo regardless what some of the news reports are saying. Sensationalism in the media is causing confusion and mild panic. 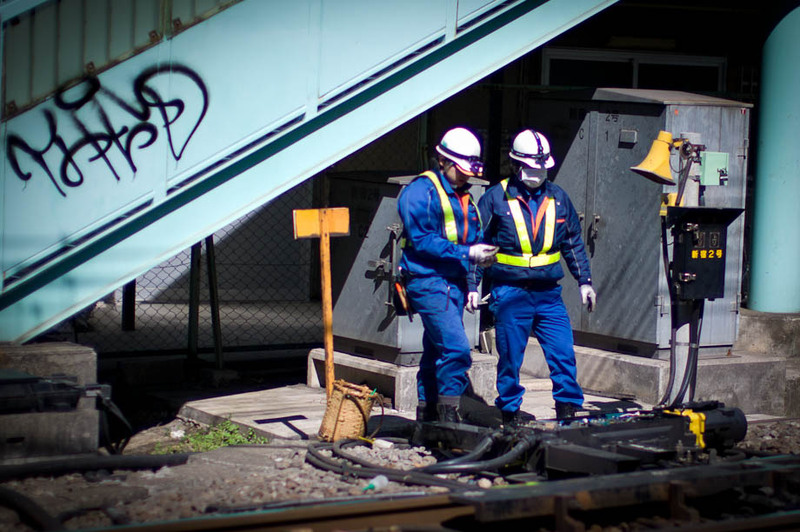 There is lots of concern about the deteriorating situation in Fukushima. Aftershocks continue daily. Start Thursday... All of the pictures were shot with a Leica M9 and a Noctilux 50mm f/0.95 lens for the most part they are shot at .95, iso 160 and various shutter speeds. 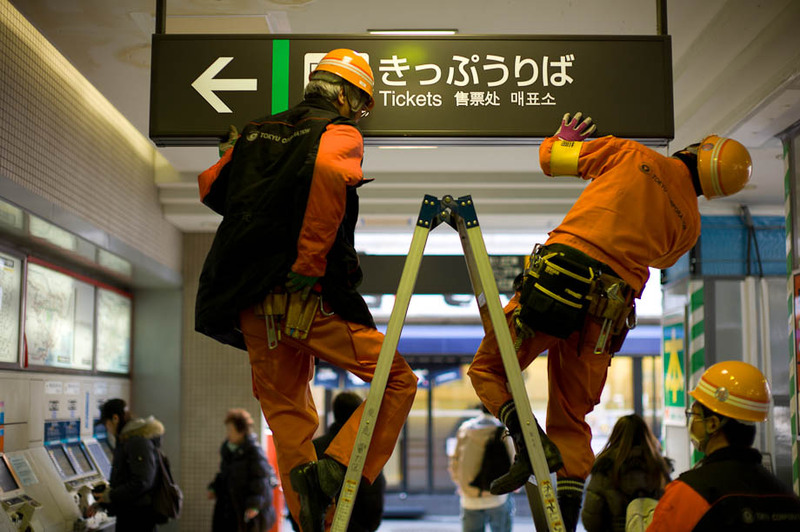 Workers check signs for damage at Nakameguro Station. 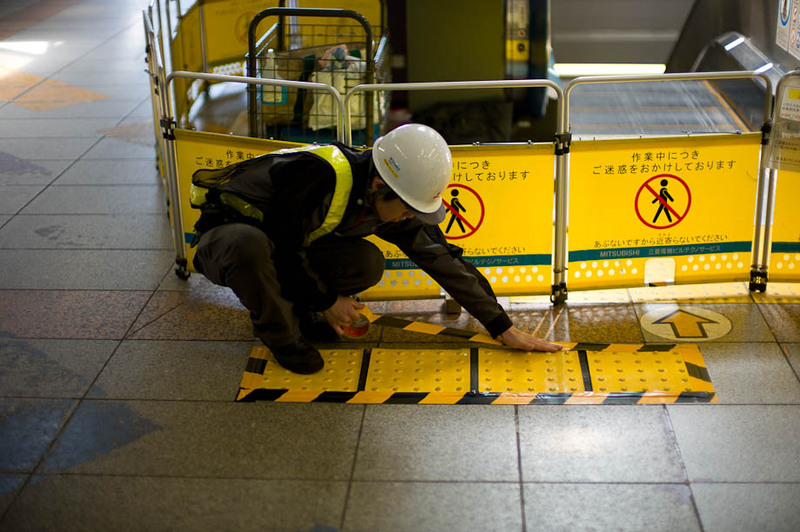 A workman inspects an escalator at Shibuya Station. 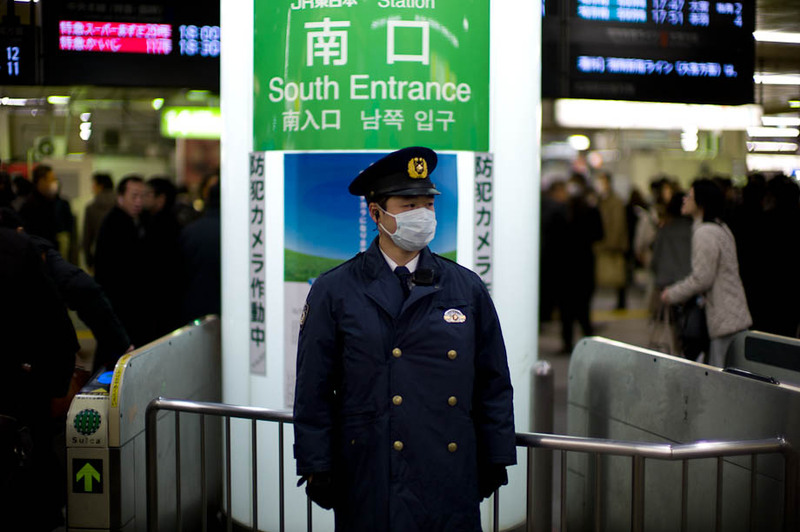 A workman inspects the ticket gate at Yoyogi Station. 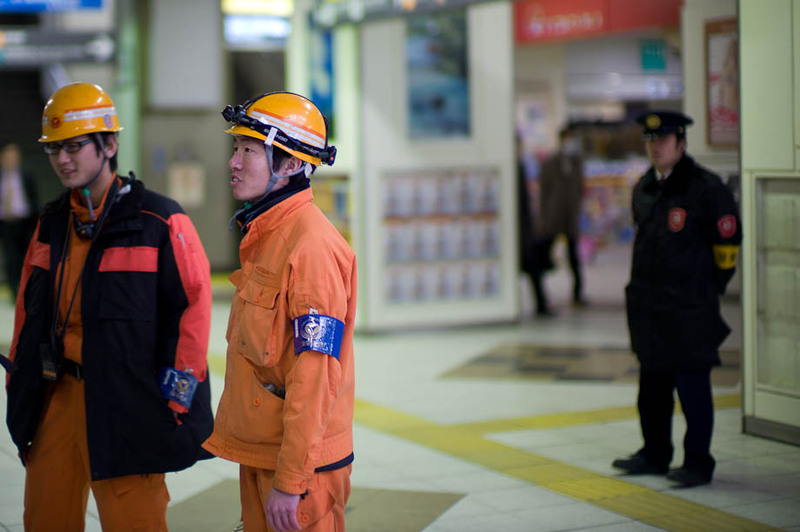 Workers inspect railway tracks leading into Shinjuku Station. Things are feeling like they are returning to normal. 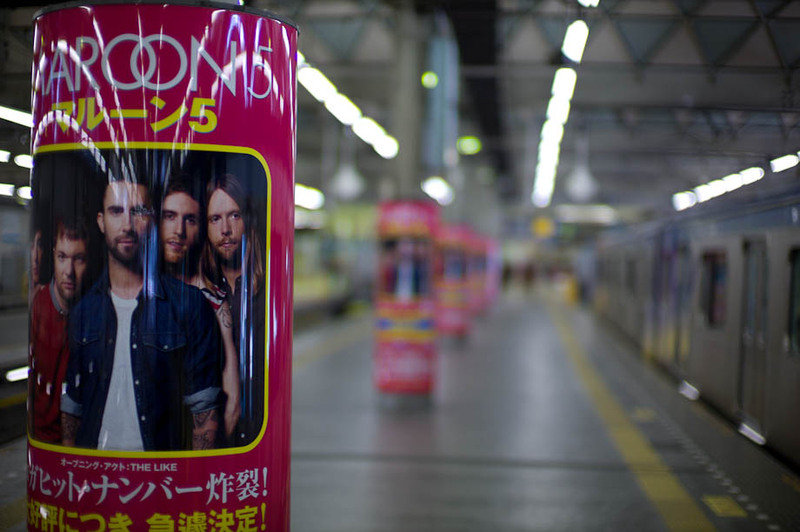 New advertising goes up to promote the Maroon 5 concert coming next month. 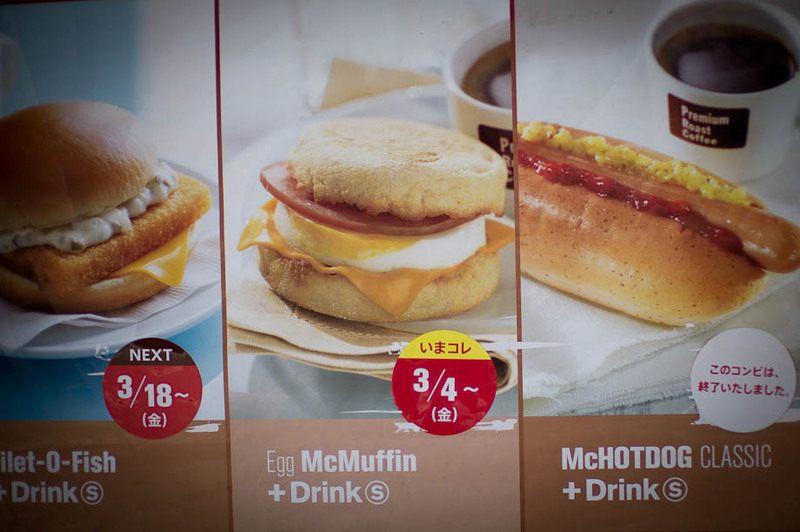 McDonald's announces their newest breakfast campaign. Workers take a break and give me a smile. 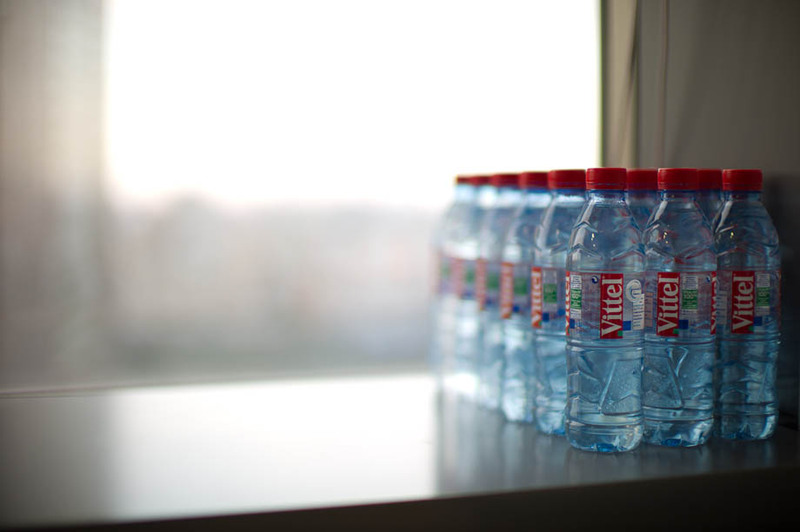 As I sit at my desk I look at my rows of water bottles. I talk on the phone most of they day at work so I keep lots of water in my office. People often tease me about it but no one was teasing me last Friday as I was the water 'sugar daddy'. 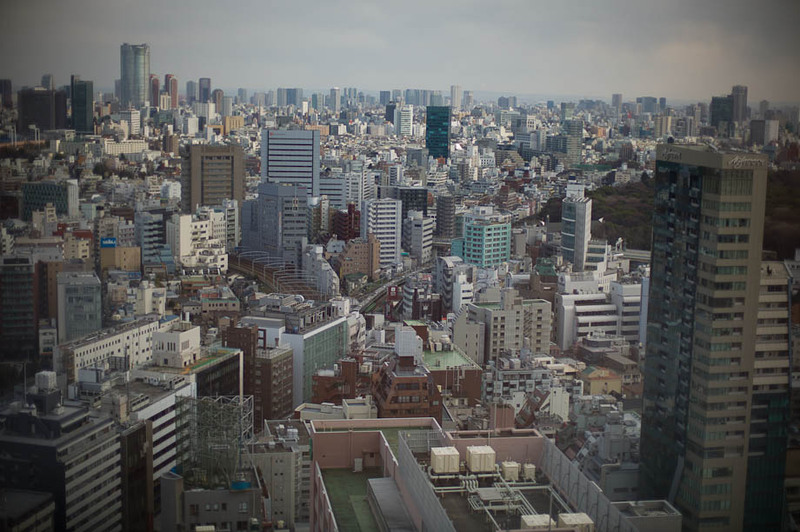 Tokyo looks peaceful as I stare out over the city. 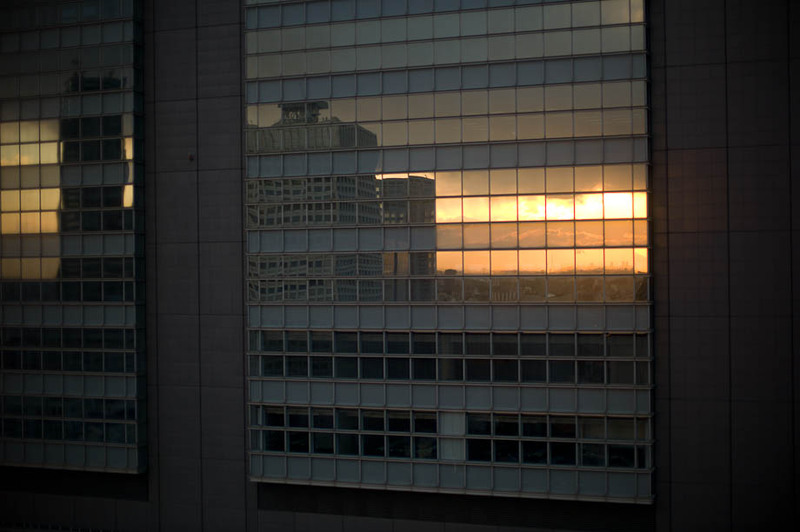 I took a moment to watch the sunset in this building's reflective windows. The same windows where I watched the same reflections of these buildings shake violently a week earlier. 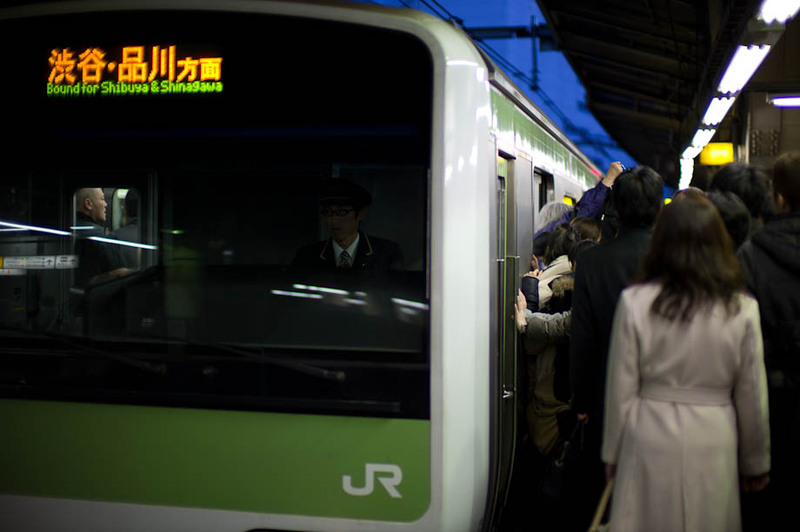 Tokyo was unseasonably cold today and as the day progressed Tokyo Electric Power (TEPCO) announced that utilization had temporarily reached 33.3 million kw against a supply capacity of 33.5 million kw and sudden blackouts were likely this evening. 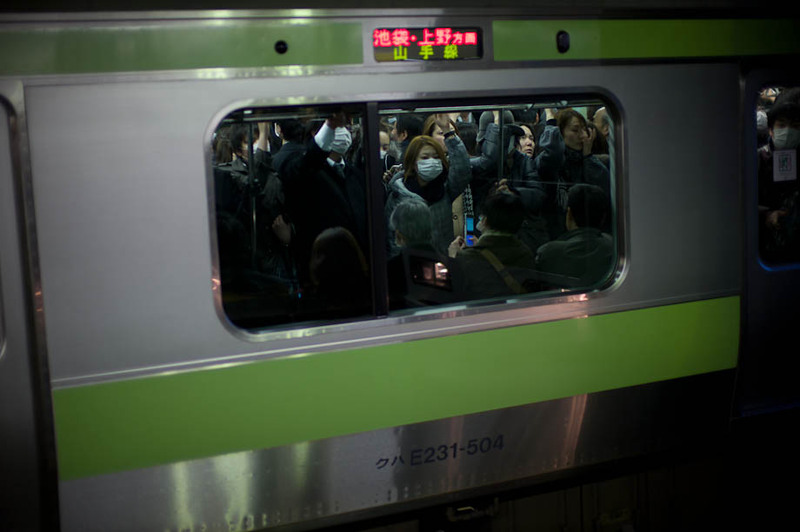 TEPCO's announcement caused near panic across Tokyo as millions of people raced for trains for fear of getting stranded. 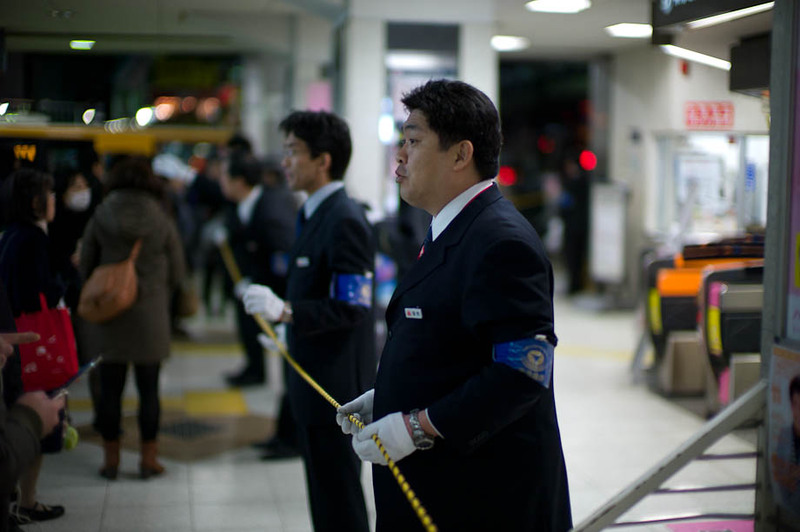 A police man stands watch at Tokyo's Shinjuku Station. 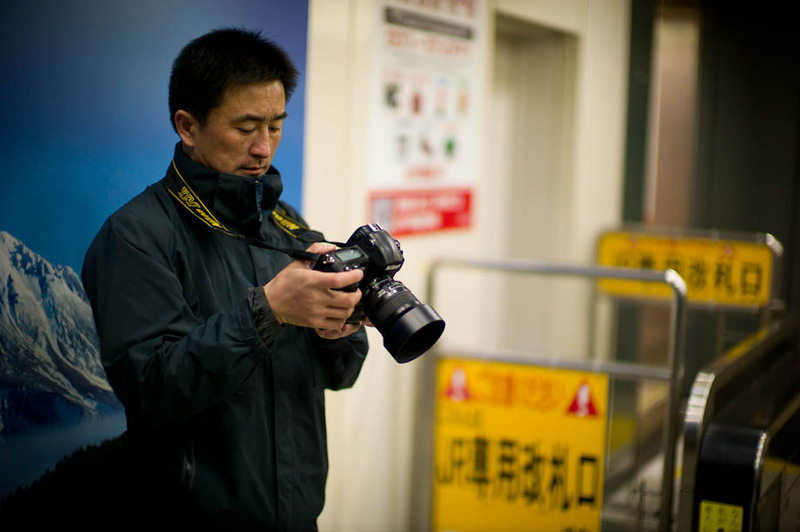 An NHK reporter hastily prepares for a broadcast. 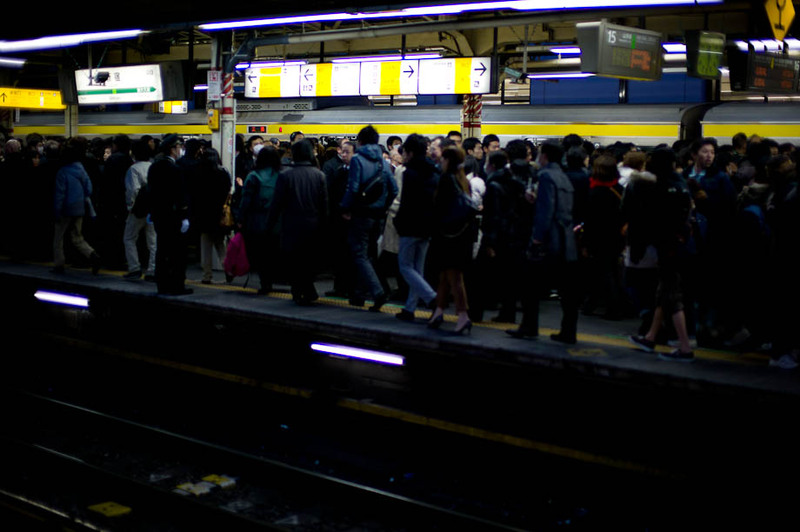 Crowds race toward the platforms. Check my twitter tab on the top left for more shots of this scene. 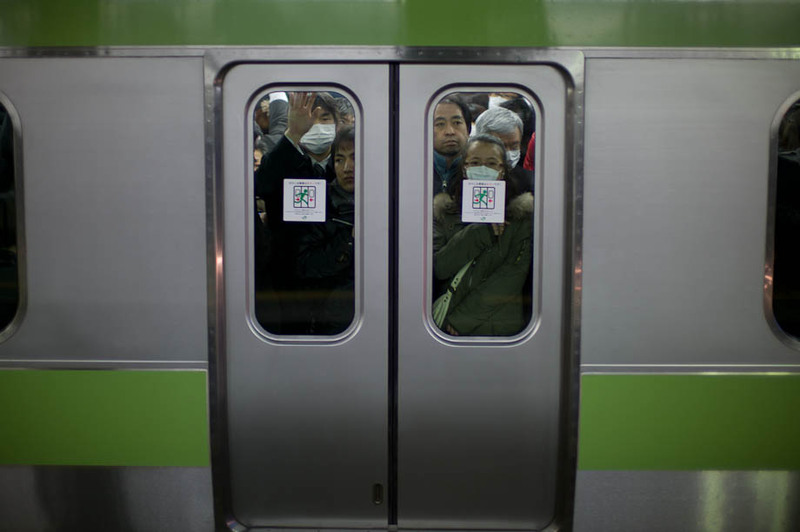 Passengers are packed so tightly into the train. I am actually standing on the little platform between the cars. 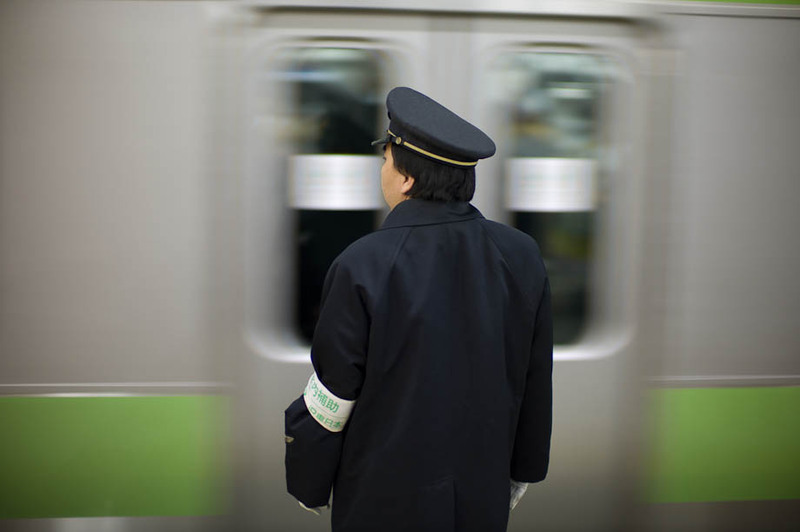 A train employee waits for the train to stop so he can direct people and keep them moving. 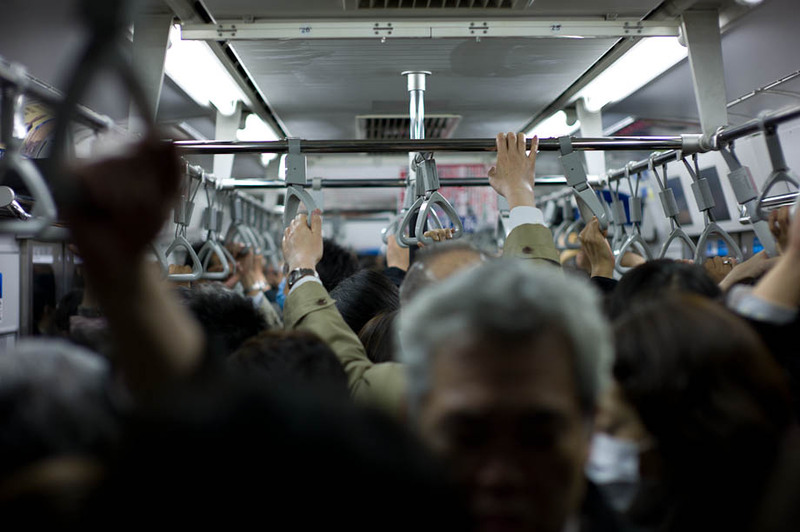 Honestly I was impressed with how fast and orderly the train staff was able to handle these crowds. 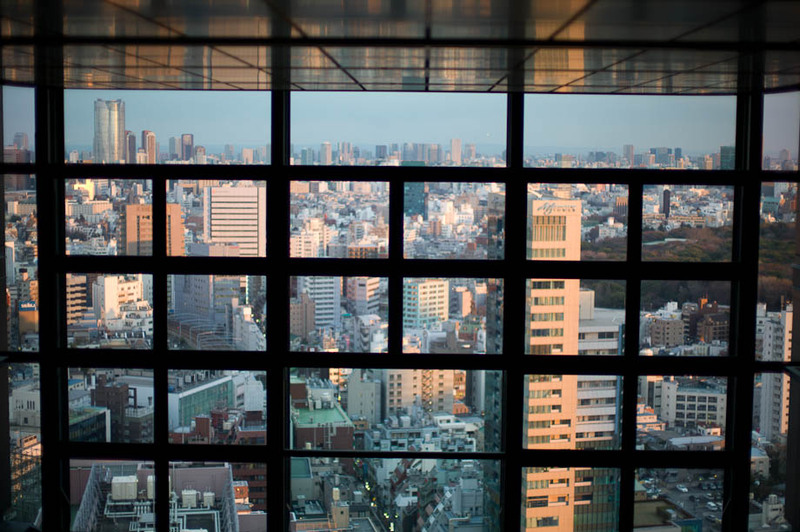 Tokyu Department Store closes at 6PM. 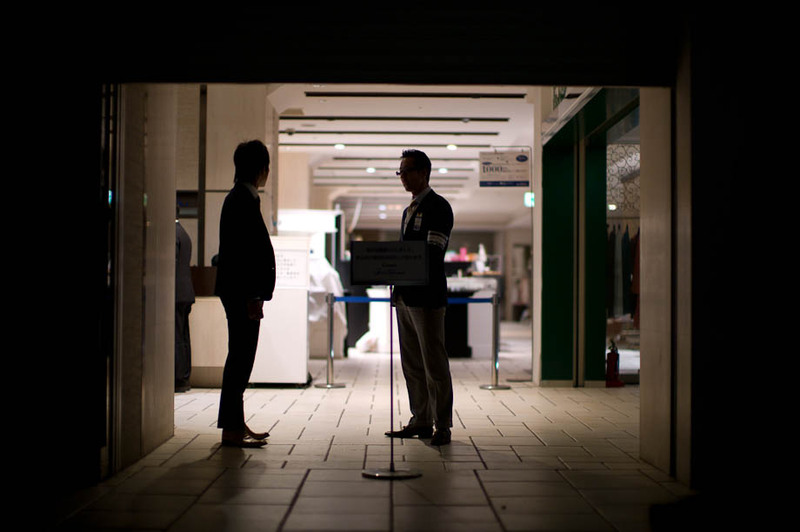 Employees stand guard as the store empties. 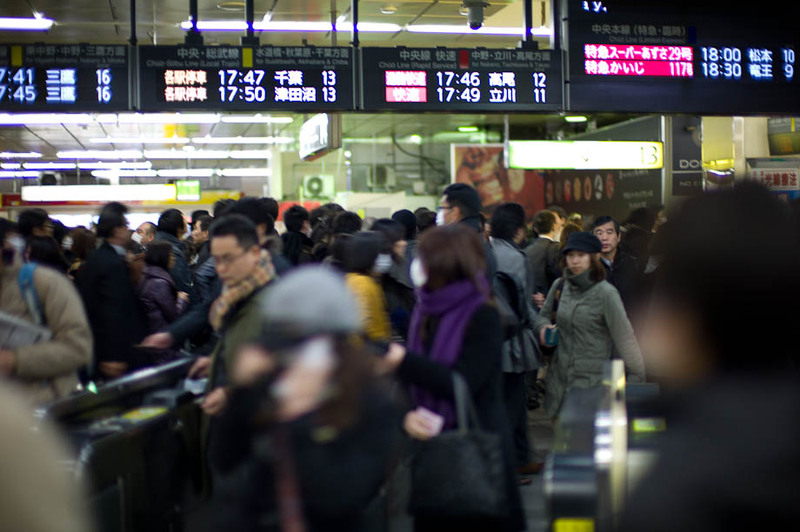 6:20pm crowds continue to rush towards the train in Shibuya. 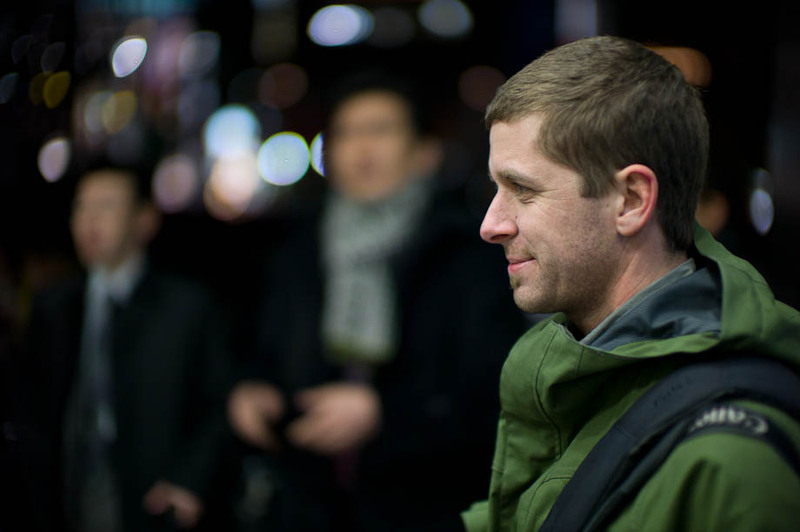 A reporter for the New Yorker takes a rest inside the station to warm up. Another reporter checks his shots. Crowds continue to race towards the tracks. 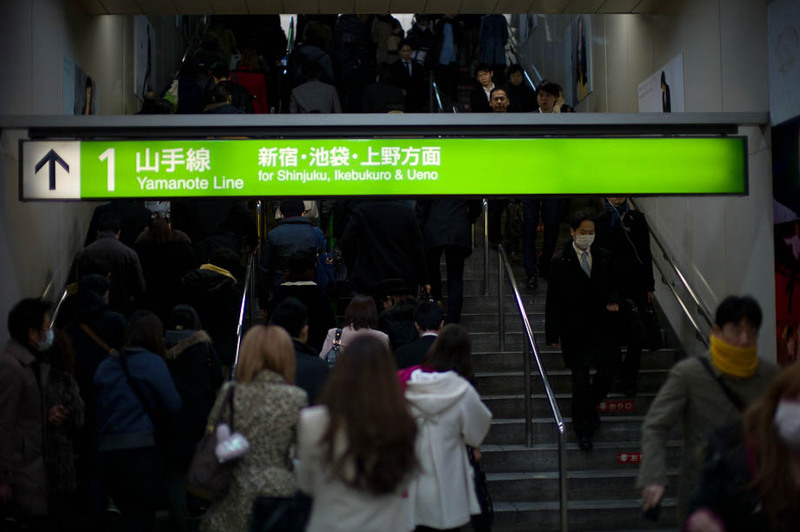 The line for the train lines that lead out of Tokyo such as the Toyoko line becomes so long that it snakes throughout the entire station, out across the courtyard and ending at the 'hachiko' meeting area. If you don't have context for this just think really really long lines. 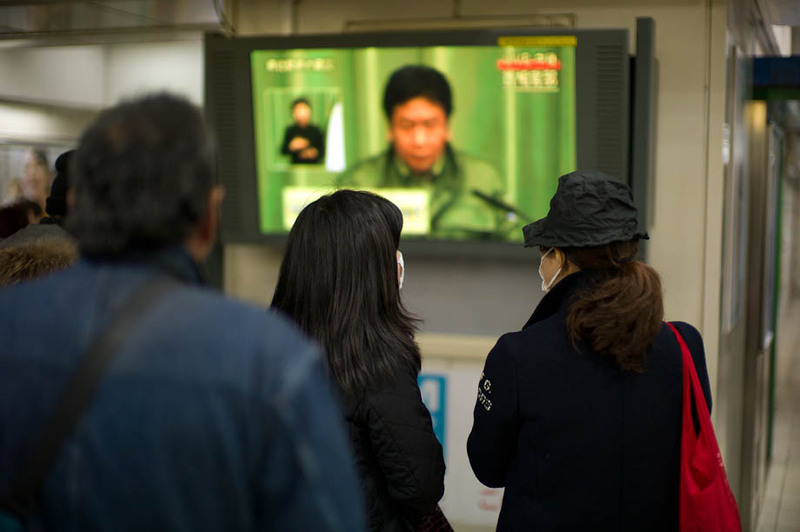 People stop to watch a government update on TV. 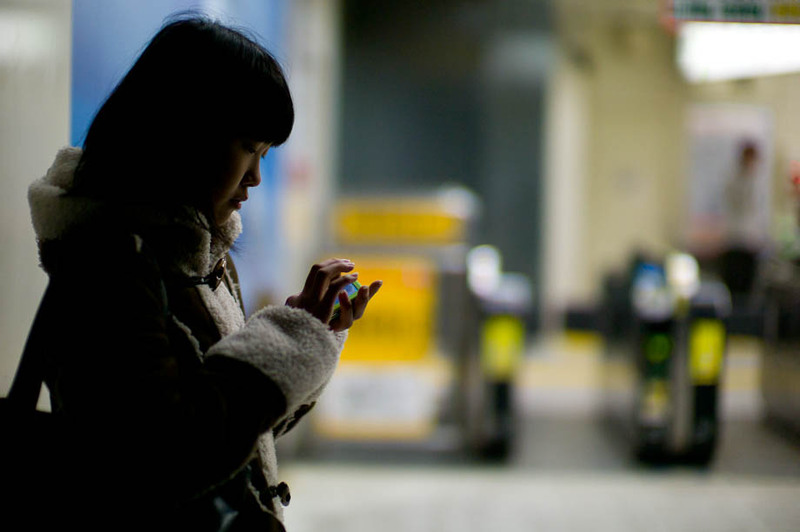 A young girl texts while waiting for her friend. 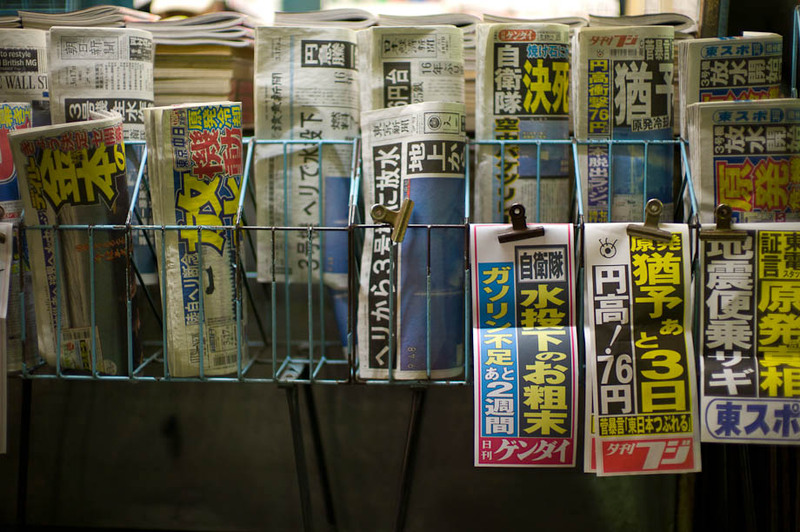 Newspapers continue with stories on the escalating situation in Fukushima. 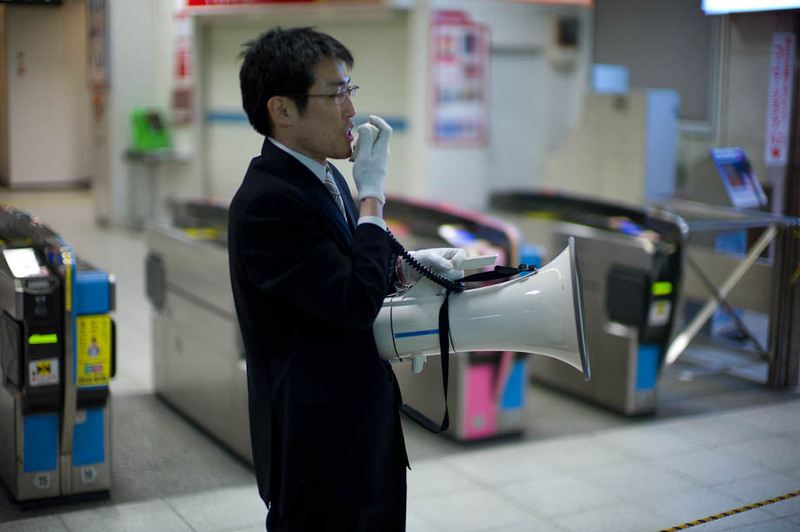 Train Station employees announce the closure of lines. Some people opt for the bus. 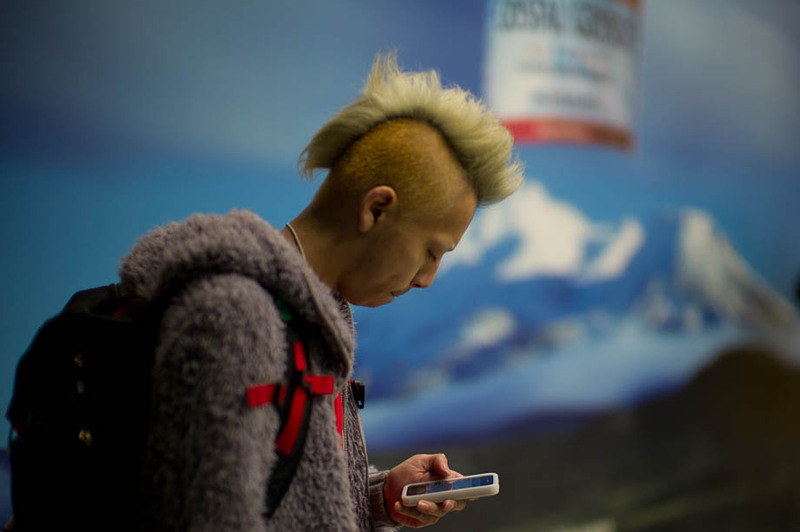 A young man, with a cool haircut, surfs the web on his iPhone while waiting for his friend. 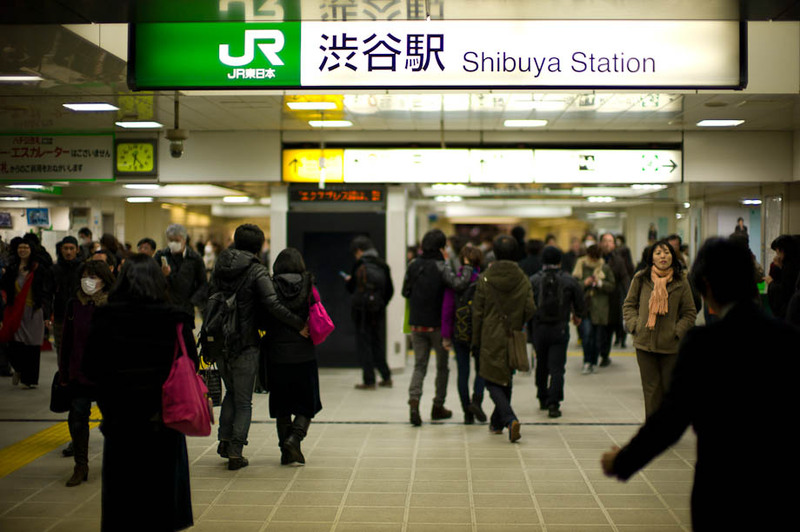 Shibuya Station is near pitch black. The long lines deter me and I head into the streets looking for a cab. 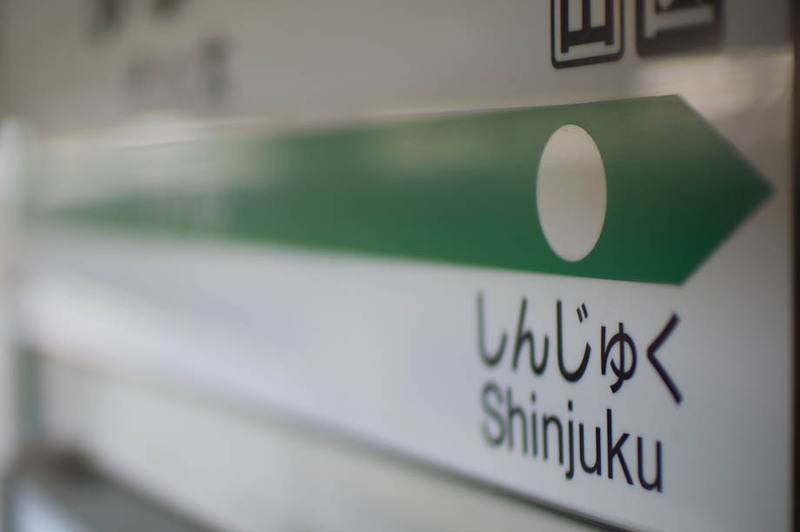 A few of my friends have opted to leave Tokyo. A lot have opted to stay. This was Thursday...let's see what Friday brings.